Chimney cleaning for your oil burner chimney or fireplace is an important thing to have done annually or at most every 2 years. 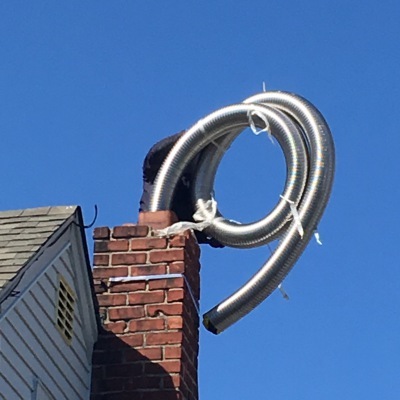 They're an affordable way to keep on top of your chimney and make sure they're in good working condition. Gas chimneys don't have to be cleaned as often but should be inspected annually. Have your chimney inspected according to the NFPA's standards. There are 3 different levels of inspection each more thorough than the last. Inspections are necessary to make sure your chimney is safe to use so if you haven't had yours inspected in a while give us a call. 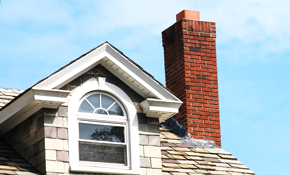 A chimney cap is the first line of defense against the elements. They keep almost all rain and snow out of the inside of the chimney which results in a longer life for the chimney's lining. They also keep out animals which is also important. All our caps are stainless steel. 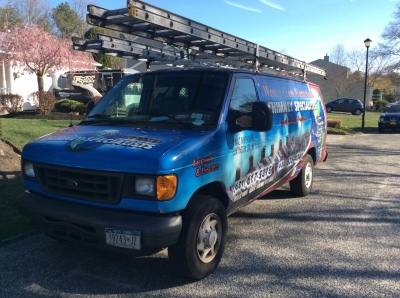 Masonry repairs are commonly needed in any chimney over 10 years old due to our climate on Long Island and New York City. Most masonry repairs are needed to the crown of the chimney (cement on the top of the chimney that goes around the top flue pipe.) Sometimes repointing is also needed. If the mortar joints are loose or missing. If there's too much damage a rebuild may be necessary. If your chimney needs a liner either because the flues are deteriorating or because you switched from oil to gas, give us a call to have one professionally installed by the best in the business. We offer great prices for the highest quality work. Don"t take your chances using another company and hope it's installed correctly. Use a pro and have the peace of mind you deserve. When your damper (some people call it a flue) becomes rusted/rotted out or is just not functioning properly, we replace them with whats called a LockTop Damper. This new type of damper goes on the top of the chimney and sits on the top fireplace flue in the same place a cap goes and opens and closes by pulling down on the wire assembly it comes with that attaches to the left or right wall on the inside of the fireplace. As opposed to a traditional damper, the LockTop will stop 100% of any rain from getting inside the fireplace beause its watertight when closed and also airtight so no downdraft can ever occur. 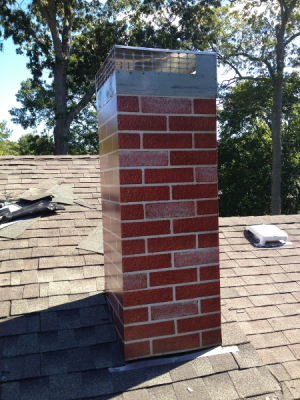 The climate on Long Island and New York City is not ideal for brick chimneys because of the cold winters. When water freezes it expands and starts destroying any chimney it comes in contact with. That's why it is important to waterproof your chimney to keep the water off it. We use a 10 year commercial waterproofing that is designed to keep your chimney from deteriorating in turn saving you money. If you don't have a brick chimney you may have a prefab housing instead. These are square or rectangular boxes with a cap on top that go around the chimney pipe to protect it. Over time they can rust out or crack and depending on the severity of damage may either need to be repaired or in some cases replaced. The same goes for the cap on top. Give us a call to have yours inspected. 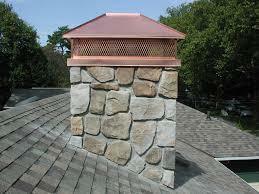 If your chimney has vinyl or wooden siding on its sides then the top of it has what's called a chase cover. Basically a chase cover is a metal plate that goes around the chimney pipe and attaches to the top of the chase (chimney structure with the vinyl/wood siding.) Builders rarely ever use stainless chase covers so of course they're going to rust out. They can be repaired in some cases but other times they may need to be replaced with a new stainless steel one.